Surface anatomy of the human body, front. 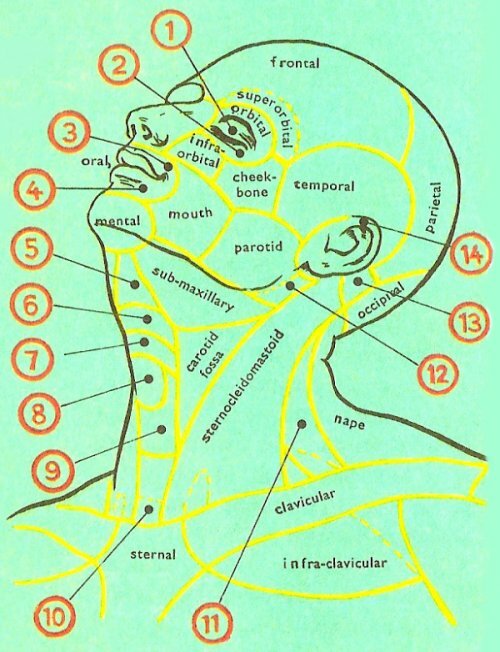 Surface anatomy of the head and neck. Surface anatomy is the study of the external features of the body. 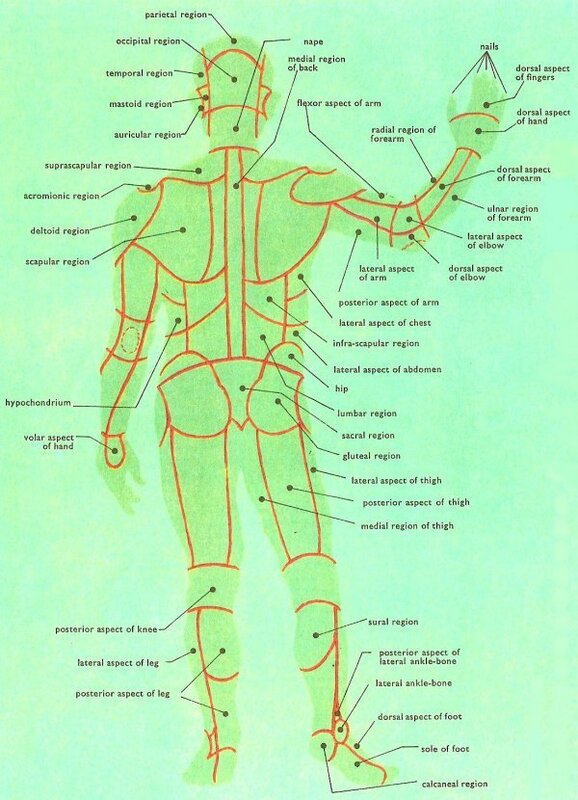 The surface regions of the body have received their names in a variety of ways. Some have everyday names like the palm of the hand, the sole of the foot, and the nape of the neck. Others are named from the organs which lie underneath the skin. The epigastrium is so called because it covers the stomach (from the Greek, gaster, meaning stomach). Depressions are known as fossae, and the one just above the clavicle or collar-bone is called the supraclavicular fossa. The large one behind the bent knee is called the popliteal fossa. Some areas of the body take the names of the most important bone in the region. For example, the mastoid regions lie over the mastoid bones behind each ear, the sternal region lies over the sternum or breastbone, and the sacral region covers the large fused bone called the sacrum at the base of the spine. Many of the bones which make up the skull give their names to areas of the head. Examples are the frontal and temporal areas. Muscles, like bones, all have names, and they too are sometimes responsible for the name of a region. The lateral aspect of the upper part of the arm is known as the deltoid area, from the deltoid muscle which lies underneath. The strong lumbar muscles in the back lie under the skin in the lumbar region. In the days when dissection was condemned by both Church and State great attention was given to the external characters. 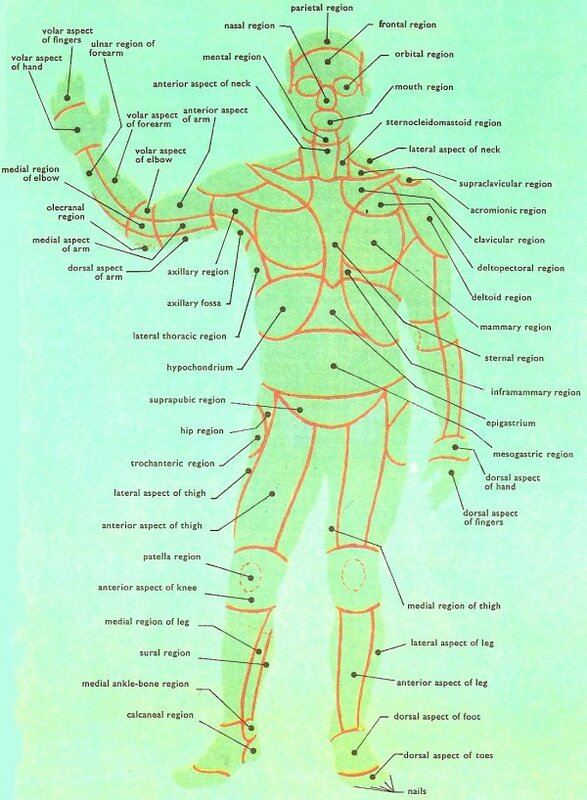 The diagrams here show how the old anatomists divided the human body into regions. Many of their descriptions and sub-divisions are still used today.